Industry leaders and key players in the plastics sector are aiming for zero pellet, flake and powder loss. Plastic pellets are a contributor to water pollution in South Africa, so businesses are hoping to minimise the loss and disposal of plastic particles. Plastics|SA executive director, Anton Hanekom, says that reducing the amount of plastic that end up in streams, rivers and the ocean is one of the core missions of the plastics industry. A global declaration of commitment has been signed by numerous plastic businesses, including Plastics|SA, that aims to protect the marine environment from plastic waste. One such environmental protection initiative that stemmed directly from the signed declaration is called ‘Operation Clean Sweep’. “When we re-launched Operation Clean Sweep in South Africa as one of our product stewardship programmes last year, our call went out to every segment of the plastics industry … to implement good housekeeping practices,” explains Hanekom. “We need the commitment from everyone to help protect the environment and save valuable resources,” he says. This includes every employee in the plastics industry – if zero pellet waste is to be achieved, it will require an effort from every individual. 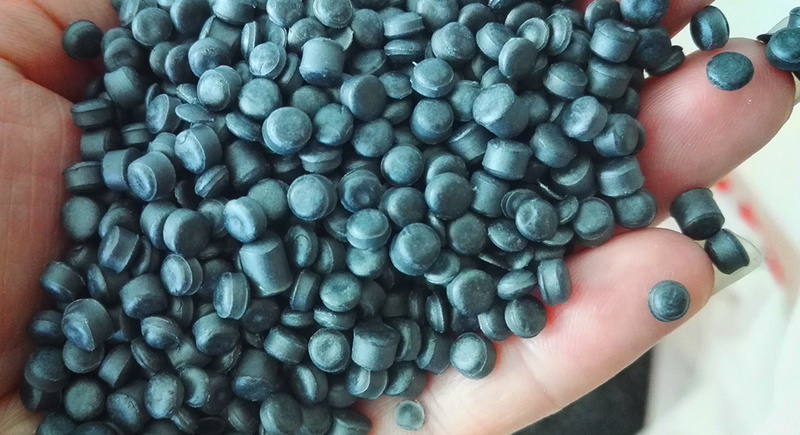 Over and above the negative implications for the environment, plastic pellet loss is also detrimental to business. “Eliminating pellet, flake and powder loss is not only beneficial for the environment, but also for business performance,” says Hanekom. It is a major cause of accidents in plastic factories, which results in employee injury, loss of work time and compensation costs. Spilled plastic pellets are slippery and, if the clean up is not done properly, they can end up in waterways and sewerage systems when washed away by the rain. Employee education is an important factor in minimising plastic pellet waste. Workers need to know how to handle and dispose of spilled plastic pellets correctly. Placing them in a bin and sending it to a landfill is not going to solve the problem. “While our ultimate goal is to help keep plastic pellets, flakes and powder out of the environment, these efforts can also help improve relations with stakeholder groups and community organisations that expect the industry to minimise its environmental footprint,” explains Hanekom. “By ensuring that raw materials are not wasted, businesses can improve their bottom line, increase efficiency and leave a lasting legacy for future generations by helping us turn the tide on marine litter,” he states. Plastic companies can enhance their reputations and increase their investment opportunities by taking an active stance against plastic waste in the environment. Small procedures such as proper care and clean-up of plastic pellet spills can prevent bigger problems for the environment down the line.